Neeeewwww Yoooork! Well, we are back on U.S. soil and although I loved all the destinations we traveled to (link) it’s good to be back! 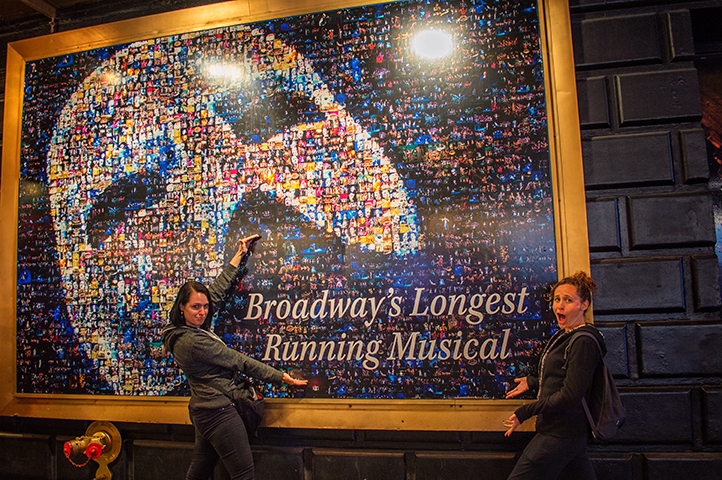 We couldn’t resist stopping in the iconic Big Apple for fun food, jaw dropping structures and a Broadway show. Is it strange that I was more excited to visit New York than I was for some of the countries across the globe? Maybe so, but it’s such a melting pot of culture! It was our trio meeting up with 4 of our friends from Utah so we had quite the group. It didn’t hold us back from doing as much as we could though! 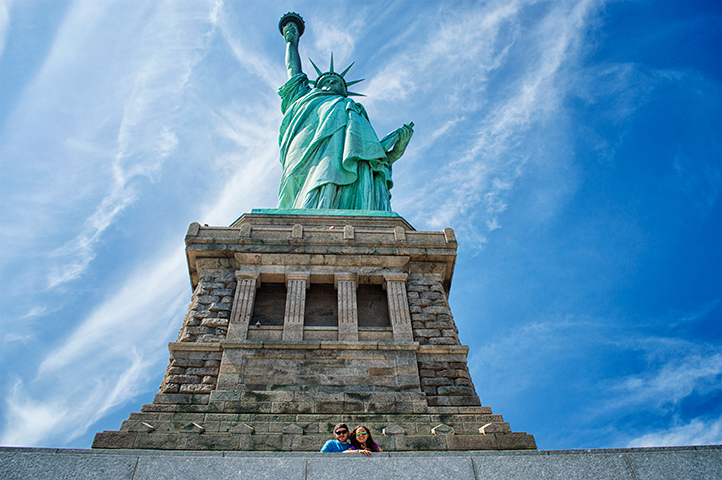 There are so many places to visit in NY I’d be impressed if you saw them all. I’ll include all the spots we made it to and planned to so you can pick and choose. This is a given when in NY! However, make sure to visit the crown and buy tickets for it ahead of time! The tickets are limited and you have to get them months in advance – it’s not as big of a crown as you’d think. We could fit about 10 people up there (hope you’re not claustrophobic!) and I thought it was a must see. Only thing missing from our visit was purchasing a foam crown to wear through the experience! To get to the Lady Liberty on Ellis island we took the ferry that they cram with as many people as possible. During the warmer months this will be more crowded and people fight for a good view. Don’t bother taking a seat and instead stand on the side so you can take pictures when you’re coming up to the Island. Being in a throng of driven people is just part of the NY experience! 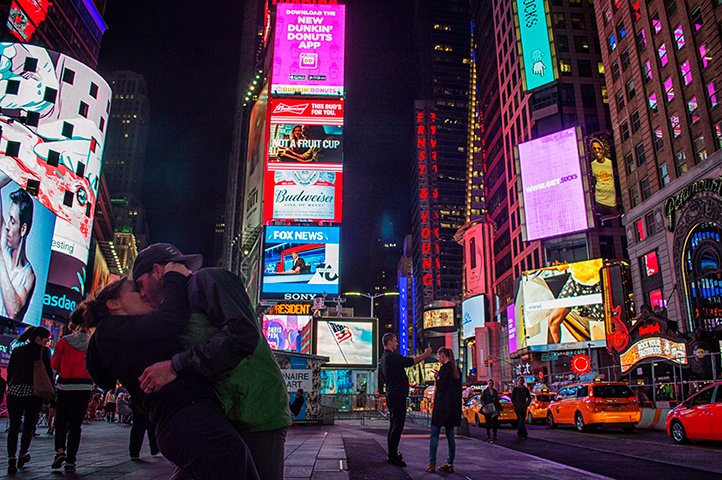 Aw the iconic Times Square… so many bright screens no one in the neighborhood needs a TV. We tried not to stare up so much while walking the streets, but I feel as if that’s exactly what the Square is meant for. Go find a treat and sit at one of the tables to just people watch and stare at screens. First time we went to Times Square it was during the day, raining and anticlimactic. Then we went again on a weekend night and it was exciting! There are certain times that we justify some splurges while traveling. It doesn’t happen often, but going to a show on Broadway was one of my get out of jail free card. I started looking at tickets a couple months in advance and surprisingly I found the tickets for Phantom of the Opera were decently priced. It would’ve been gratifying to see the reputable Lion King, but tickets were more than the Phantom, which I wanted to see more. Me and Melissa saved the guys the torture and went to the theater by ourselves while they ventured the city. We sat in the second to last row in front of a noisy prattler. He was shushed by us so many times I felt like we were the more distracting. It was classic, I loved the entire experience. 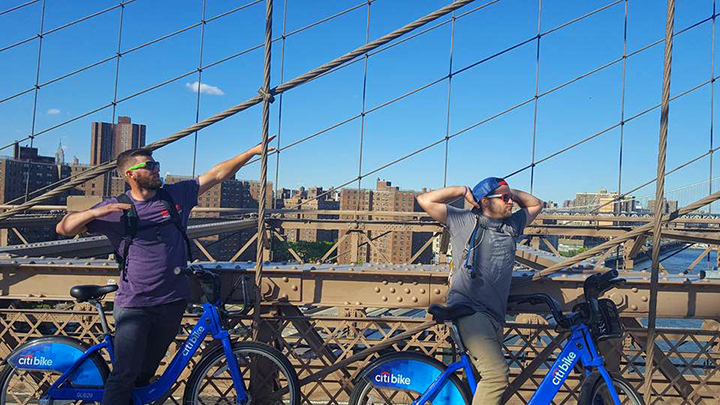 A couple of the guys rented bikes to take across the bridge. The rest of us wanted to have the time to stop, enjoy the view and take pictures. We also didn’t want to deal with having to weave through the throng of clueless tourists stopping to look around. Once we arrived at the South-East side of the Bridge we stopped at a well recommended coal fired pizza joint called Grimaldi’s. This delicious establishment was conveniently located next to the Brooklyn Ice Cream Factory. Outside of the restaurant we had a great view of the city and Brooklyn Bridge for sunset. 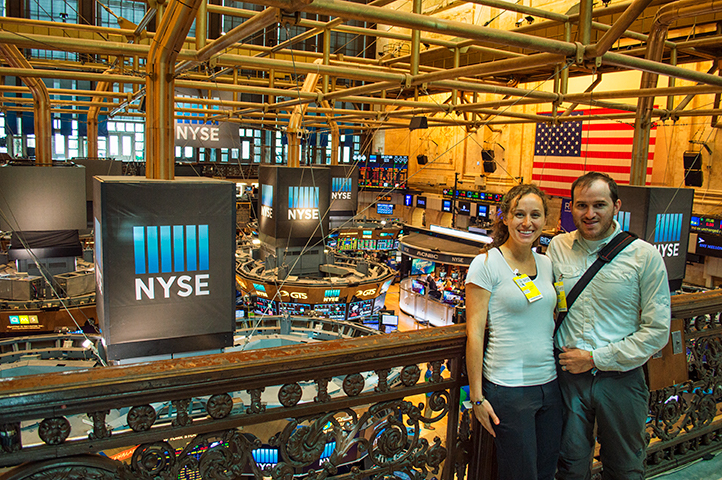 Pablo’s brother works for a stock company and was able to get a tour for all of us to walk through the stock exchange. There was a mix up in communication and we weren’t allowed on the floor dressed as we were, but we were able to view from the viewing platform right above. It was calmer than seen in the movies (isn’t everything) with only a handful of people on the floor working. Everything these days is run digitally and the need for sellers on the floor is relinquishing. Granted, how many tourists are allowed into Wall Street? Like many of our fellow Americans one of our favorite past times is eating. It’s a large part of our travel, right? You not only want to see and feel the culture, you want to taste it. We went to many different places to eat at different types of food joints. 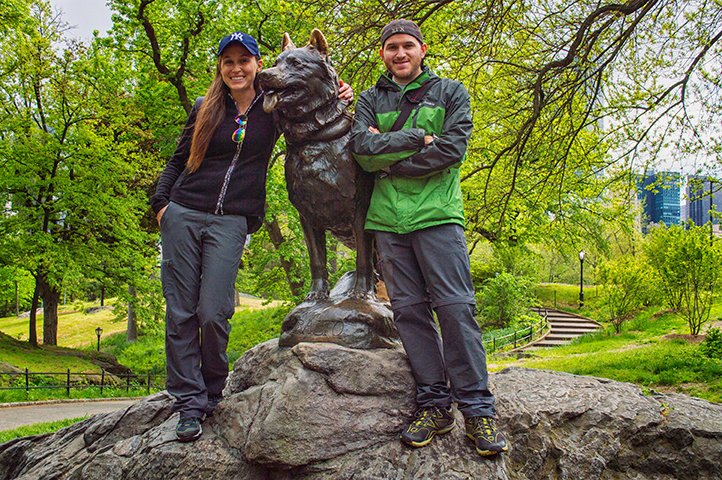 Burgers at the Shake Shack, cupcakes at Magnolia Bakery, meatballs at the Meatball Shop, hot dogs from street vendors, pretzels in Central Park and as many other delicious stops we were able to head to. 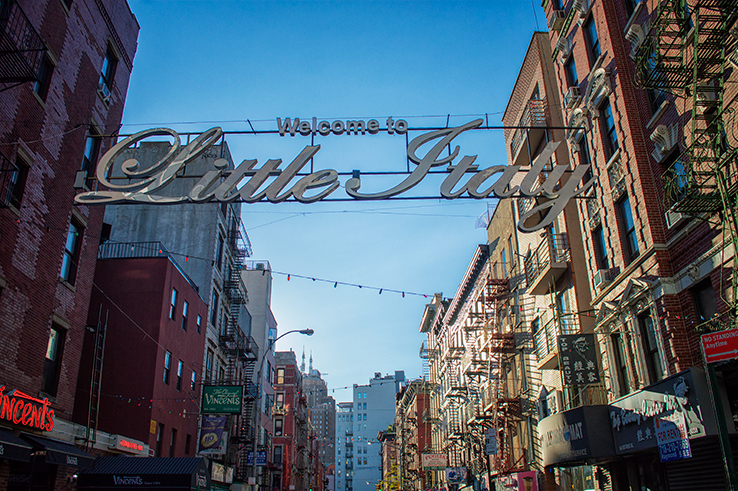 A great place to meander to for great culturally diverse food is in Little Italy and China Town. In China Town we had fresh dumplings and cooked duck. I loved walking the street looking at all the different options and popping into stores to see gems like Trump’s, “make America Great Again” shirts. When we headed over to Little Italy we were kicked out of a restaurant simply because of how we were dressed. It’s sounding like we dress terribly with our experiences. The fact of the matter is we don’t carry our sequined dresses and black tuxes on every trip we go on. That was fine though, we headed a block over and found something better suited for us. I remember watching on the TV when I was a kid seeing the events that rocked our country. We paid tribute to those who lost their lives that day in solemnity as we walked Ground Zero. 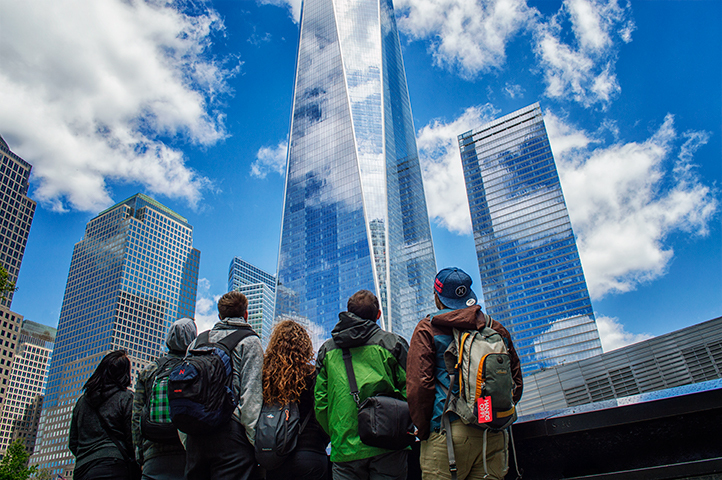 Tickets need to be purchased to visit the top of the newly built Freedom Tower and museum which you can easily buy the day of. Some of us went to the top and through the museum while others walked around for a couple hours. If your group needs to split there’s always something to see or eat nearby. NY is a maze of distractions. There are several buildings to pay to visit the top of, but with a budgeting group of people such as ourselves we had to pick and choose. 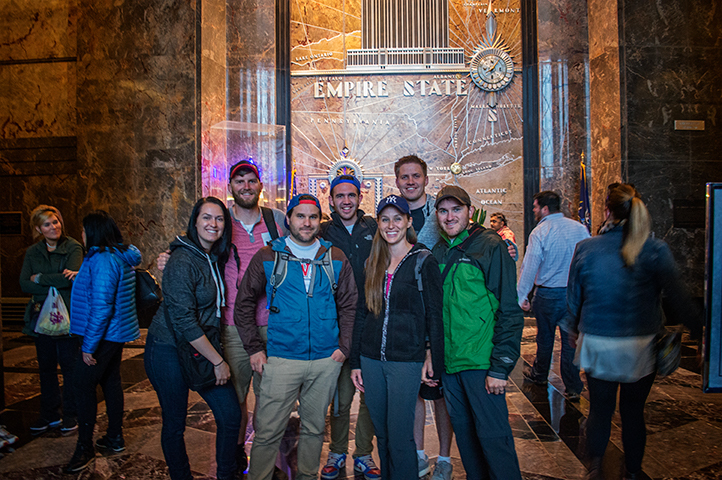 We decided not to buy tickets to go to the top of the Empire State Building, but enjoyed hanging around the lobby for a little while. We even ran into some people we knew from back home. Go figure huh? 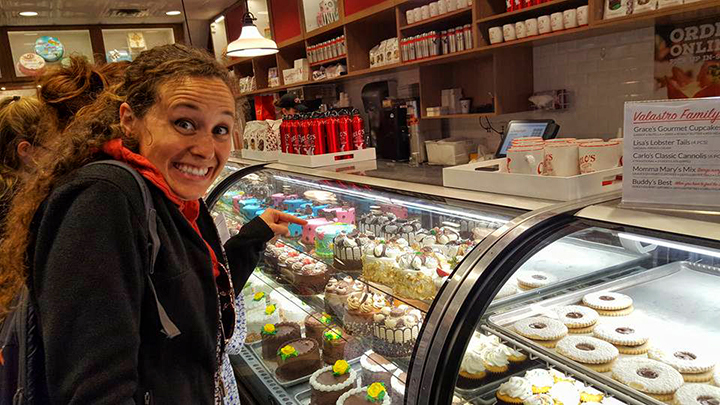 I’m sneaking this in because we took a 30 minute bus ride over to Hoboken, New Jersey to visit Carlo’s Bakery. If you’ve seen the show Cake Boss you’ll understand why we wanted to go there. We saw some of the Velantro family and drooled over the displayed canollies and cookies. We sampled many and purchased more to go. We crossed the street and had Philly cheese steak sandwiches at the deli happy with our days events. I won’t drown you in too much information so here is a list of other sites that we visited, some of which are free! Rockefeller Center- Even better to visit during Christmas Time for the ice skating and lights. We went into the lobby to take a glance, but the fellas were more interested in the gaming store just next door. Central Park – great place to take a nap and throw the frisbee. Both of which I wanted to do. Neither of which we did do. St. Patrick’s Cathedral – beautiful stained glass windows and architecture. We’d been to many cathedrals post Europe, but there was something more interesting about it being in the center of such a loud city. We walk through the doors and it grows peaceful. Kayaking the Hudson – I really wanted to do this, but it just didn’t happen. If you are interested they offer free kayaks for use. There are several other museums that are free at certain times of the week. If you want a more detailed list of free sites click here.